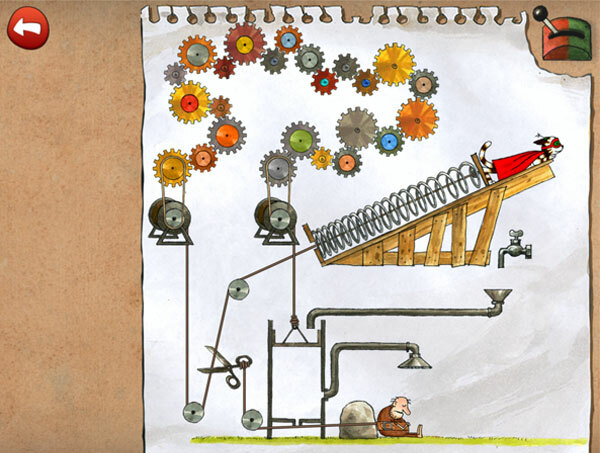 Pettson’s Inventions is a great app, but it can get tricky. 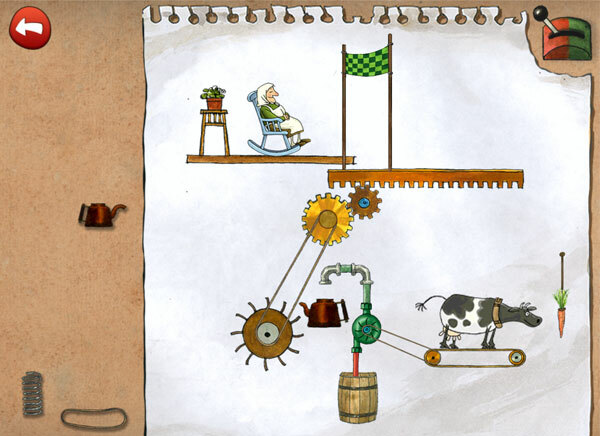 There aren’t any hints, or even a way to skip levels, and we’d hate for you to get stuck. 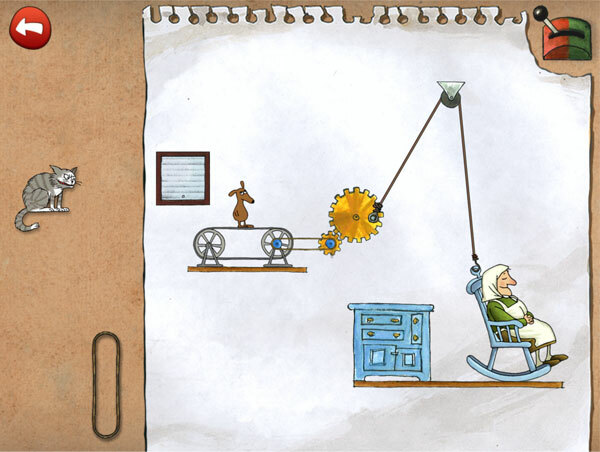 Here’s a Pettson’s Inventions Walkthrough in case you get too frustrated. 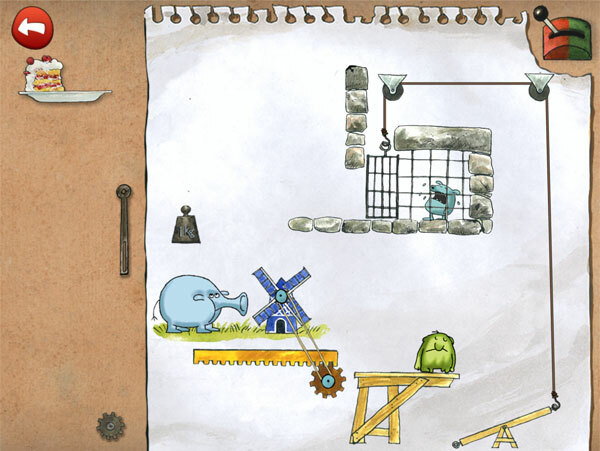 Each completed level is pictured below, in the same order as the app’s levels. Use the pictures as a guide and you should do fine. 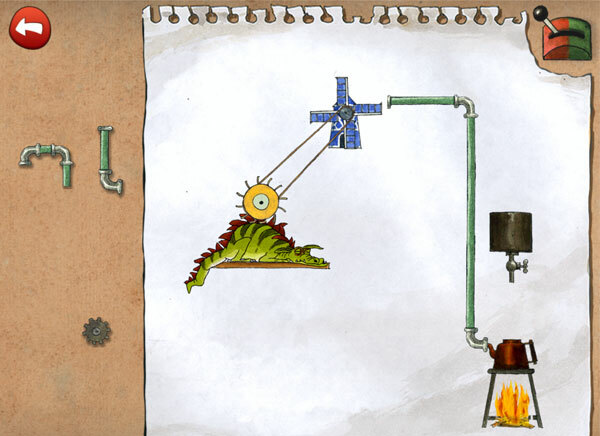 May the cogs be with you! 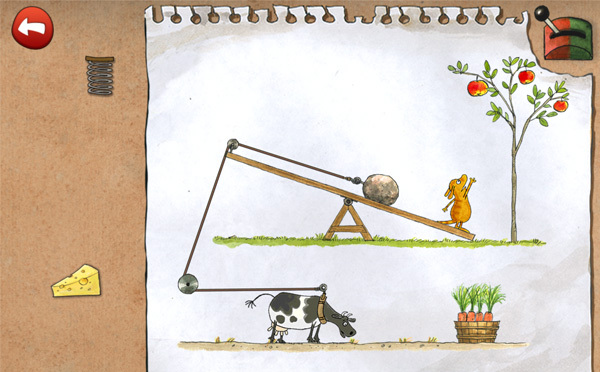 In Pettson’s world, Cows like carrots, and ropes like tugging… so give that cow some incentive to pull that rock and lift the animal to the apple. 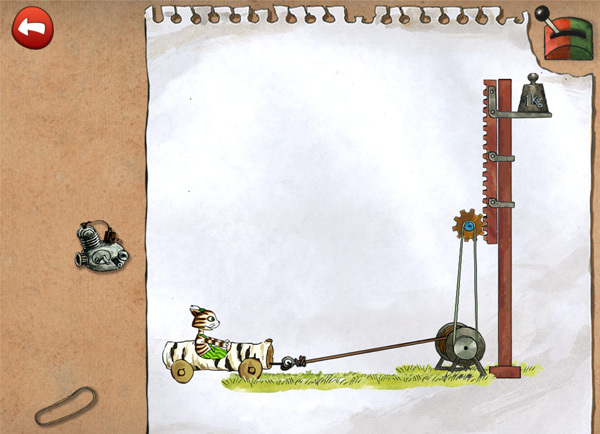 That cat wants to drive, so use some rope and bands to pull the cat when the weight drops. 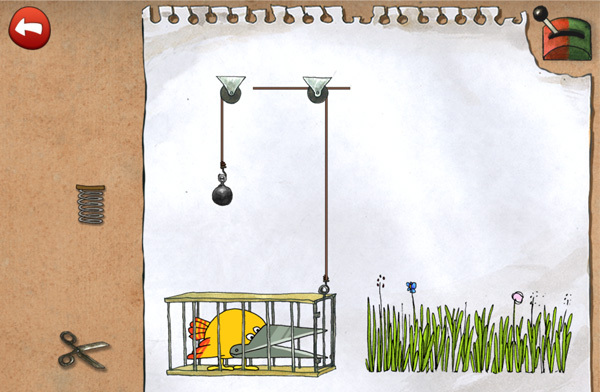 You need to cut that grass, so use the weight and rope to pull open the cage. Set free that scissors bird and watch it mow like a champ. 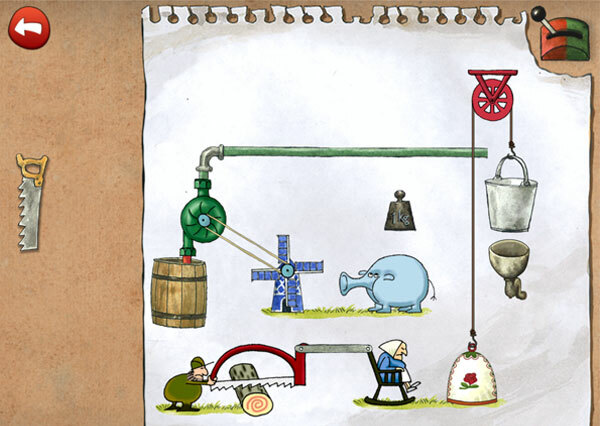 That duck really wants a shower. 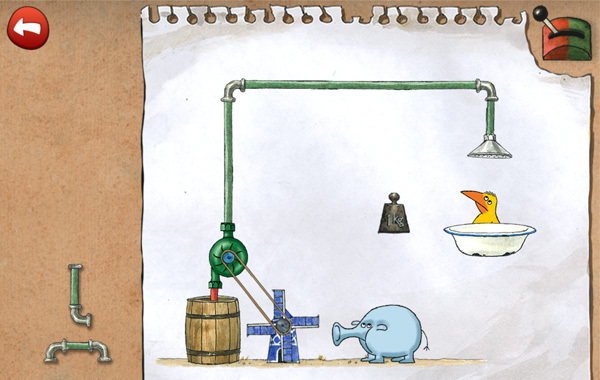 That blue creature blows air, which spin the wind mill, and if it’s attached to a pump… then a few well-placed pipes will give that bird all the water it wants. Everyone knows cats love strawberries, right? 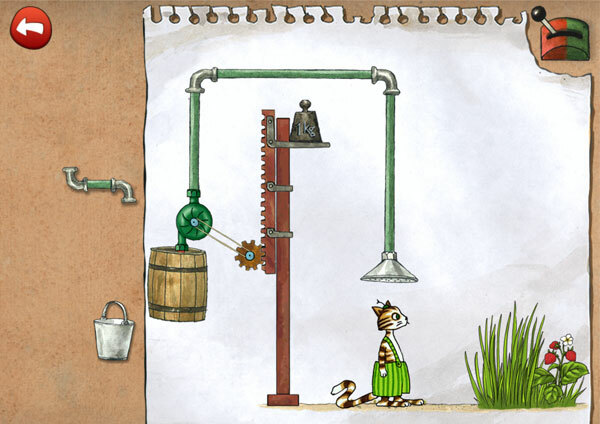 Give the cat a little water incentive to move forward toward the fruit. Pettson does not like it when people sleep and the old man is taking a nap. 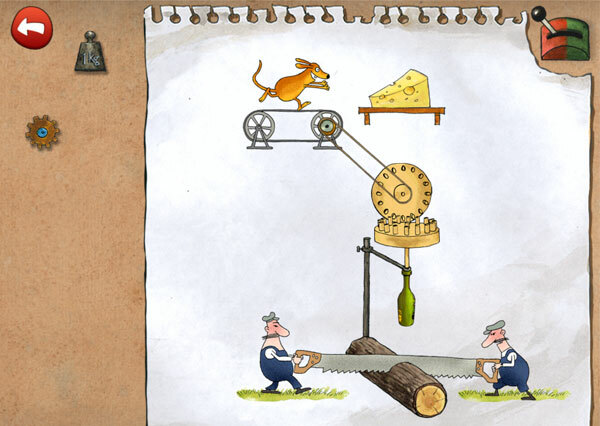 A giant wedge of cheese, plus a little gravity, will wake him right up. Now an old lady is sleeping in her rocking chair. see if you can lift the cover in front of her and she’ll wake up. 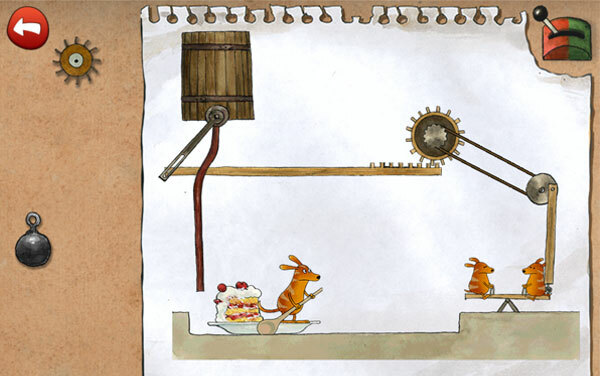 Use the blue animal to blow the balloon (and its dragon cargo) toward the sharp saw. 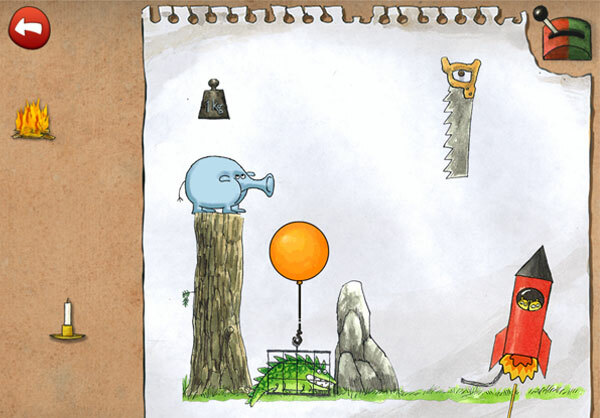 When the balloon pops against the saw, the dragon will line up perfectly with the rocket’s fuse. Up up and away! The little man loves his tea! The monster hiding behind the shade will scare the animal into powering a jury-rigged lift to elevate the man all the way to the top. 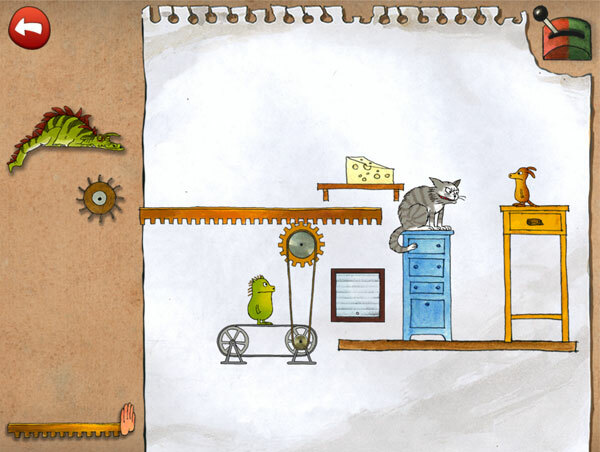 Put the candle in the candle holder and maneuver it so the conveyor belt passes the dragon and ends up beneath the kindling. The tea will be ready to serve in just a minute. Nobody likes a dirty pig. 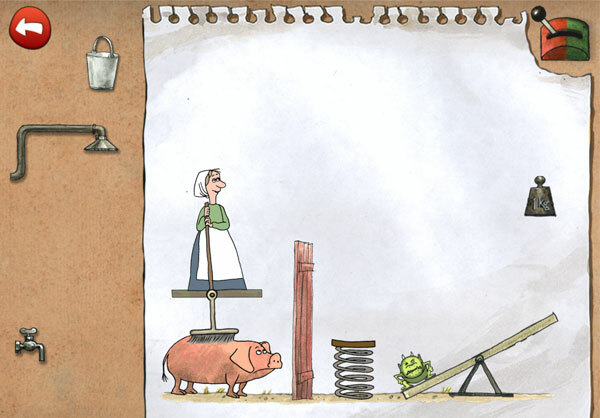 Help the lady scrub the pig with a brush, by making the monster fly up and down on the teeter totter. She’ll alternate being scared and curious and clean the whole time. Hook the old lady’s rocking chair up to a pulley system, and the monster behind the shade will help power a wonderful rocking system. Sawing a log isn’t hard, right? 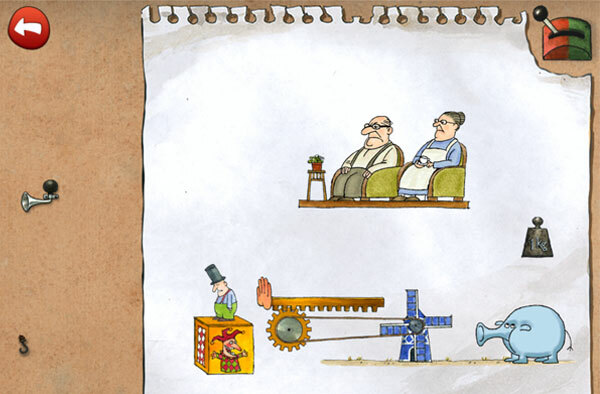 It is when you hook up all the gears and nothing seems to happen. This one catches a lot of people, because it’s difficult to figure out where the bottle goes. 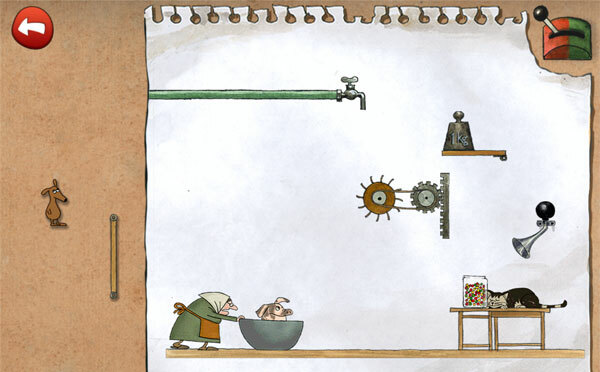 Once you hook up the rotating gears, you can place the bottle directly below the bottom gear. As the bottle rotates, it will alternate scaring the loggers into moving back and forth. We really can’t keep those pigs clean! To give this pig a bath, you’ll need to scare the cat into talking over some gumballs so the old lady can push the pig under the water. Help this poor animal get the cheese! 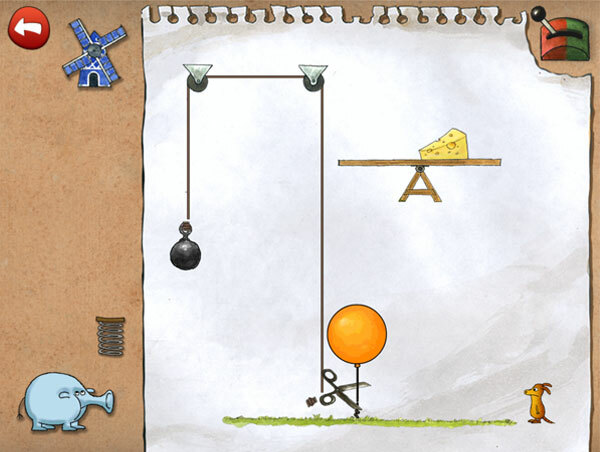 Use the scissors to set the balloon free, and the cheese will slide directly in front of him. More cheese! This time you have a vicious looking cat in the way. Scare him off and your little friend can march straight to the cheese. Push off the sad little man because he’s a real party pooper. As soon as he’s out of the picture, the jack in the box will spring into action and the jester will cheer everyone up. Dragons need love too. 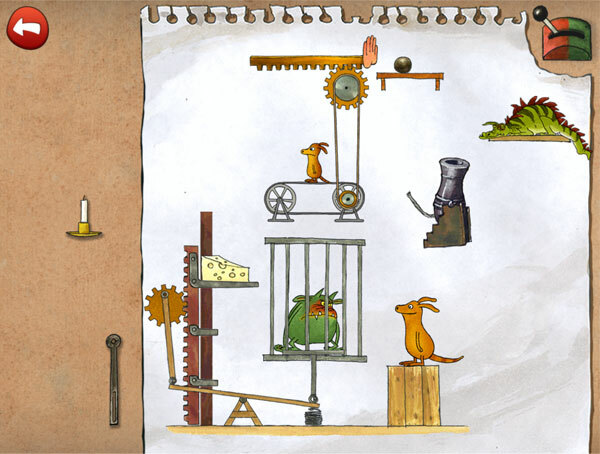 Position the pipes so steam will power the windmill, and you’ll give the dragon all the affection he wants and needs. The old lady is asleep again, but if you take away that little animal’s cake, he’ll put up such a fuss that she’ll be startled awake. 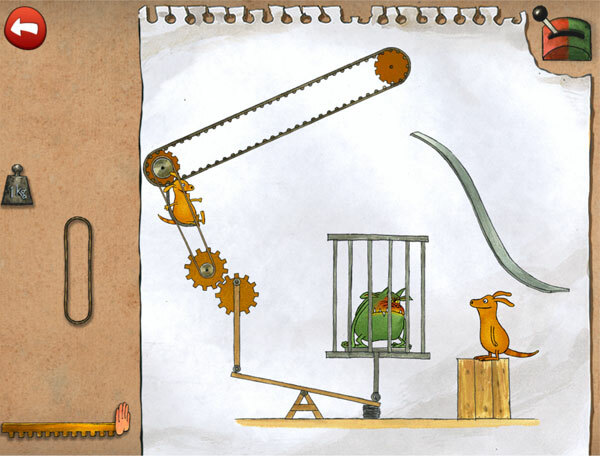 Place a spring under the monster’s cage so it has enough bounce to raise the cheese. The rest is destiny. Everyone deserves cake! 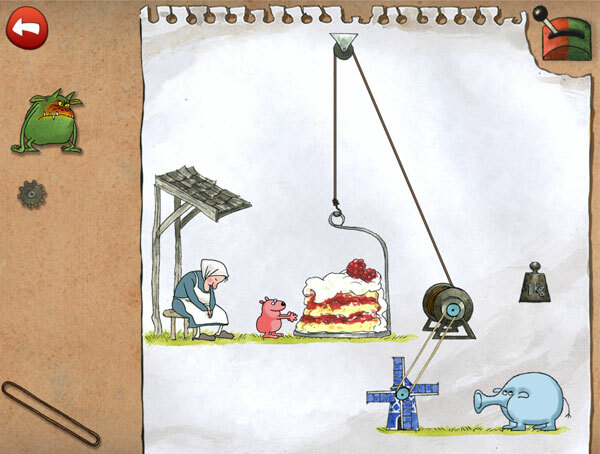 Help the animal cross the water so he can bring his friends dessert. Crank that animal up to the slide and watch him have the time of his life! There’s a blue monster in that cage and he is not happy. Free that little guy with the judicious use of pulleys. 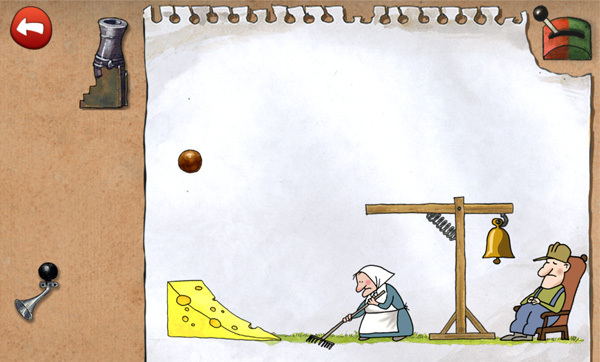 If grandma can’t cross the finish line, bring the finish line to her! 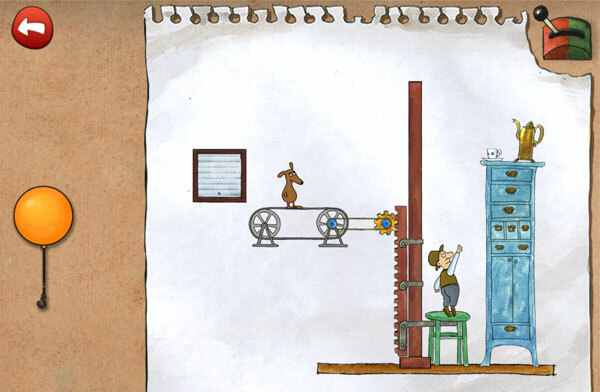 If you’re on the final level and having trouble figuring out where to put all the little cogs, keep in mind that each little stud is a different color. If you match the color to the center circle of the cog, it will fit. Some of the colors are so similar, that nobody will blame you if you just use the picture (or guess and check). Congratulations on your victory! Pettson will be so proud.